We all know that blogging can be a big deal for our businesses, but writing your first blog article is one of those things we keep pushing off (like a paper in college). Writing blog articles should not only be an integral part of your business, but you should be doing it right from the start! Without blog articles you limit the amount of organic, personalized content you can share on social media, you limit your brand by not having an independent voice that can stand out from the crowd, and you also limit your SEO (search engine optimization) because blog articles provide a great resource for keywords, boosting your visibility in Google search results. Even with those benefits, it's still hard to sit down and start writing. What do you write about? What if no one reads it? What if you hate writing? Where do you even start? It's easy to say "Just sit down and write!" but the fact of the matter is, it's not actually that easy if you want to get something out of it! Just like everything you do for your business, your blog articles should be written with intention and the majority of us cannot just jump feet first into an article-a-day writing schedule and see clear results from it. We're breaking it down into the 9 steps to writing your first successful blog article and keep a writing schedule you can stick to. Step 1: Clearly outline who your audience is. This is probably the most important step because you could write all day but if you aren't writing to your audience, then it's not going to help you. For example, if 3 Step Solutions were to write articles for enterprise clients like Coca-Cola or Amex, we wouldn't be reaching our actual audience. The language we would use for those enterprise businesses and the strategies they are looking to learn more about, wouldn't translate well to our actual audience of entrepreneurs and network marketers. What is your audience looking to learn more about? What age range do they fall in? What type of content do they interact with the most (videos, images, long pieces of writing - also known as long-form content, or short pieces of writing)? You may not have the answer to all of these questions and that's okay because you will discover the answer as you write more blog articles and can adjust your blog article strategy (that's right, you're building a whole strategy here!). What are some common questions you get from customers? If you don't have customers yet, what are some things about your product or business that confuses people? These types of topics are going to get people that are searching or stumbling across your content to click on a link and read your blog article! I like to write out 10 ideas and pick my favorite, one that I am excited to write and share with people. You can always keep those other ideas in your back pocket (or a content calendar) for future blog articles. You have your topic, now narrow that topic into a keyword or phrase. By narrowing your focus in this way you can hyper-target what your audience is searching for online and increase your blog article's ranking in search results. You can also make sure that as you write or after you finish writing, you have that keyword throughout your blog article as much as possible (look through this one and see how many times I've used "blog article" 😉). Whether you have chosen an extensive topic or a fairly direct topic, you want to outline the pieces you want to focus on and the points you need to hit. If you were to skip this step and instead just write, you may realize by the end that you didn't actually stay on topic or you missed a glaring piece of the puzzle. Step 5: Write the body content! Now comes the time to start filling in the holes! You outlined each major topic you'll be covering in your article, so just fill it in. Explain those pieces, help people relate to what your topic by using a conversational tone and similes/metaphors. Don't worry about getting every sentence perfect, just worry about getting the information out of your head and onto the page (or screen). Don't worry about the introduction to your article yet, we're gonna tackle that next! I find the hardest part of writing blog articles is the introduction so I always push it to last. I can easily wrap up an article, summarizing everything I spoke about and ending with a prompt for my reader to act in some way, but the introduction - easing someone into a topic- stumps me for some reason. Write out your conclusion with a couple of sentences summarizing what they just read and prompting readers to act in some way, ask them to comment with their opinion, take a quiz, or connect with you on Instagram for more information. For your introduction, think about how this topic would come up in conversation, bring up why it's necessary to cover and how you feel about the topic, then lay out how you're going to help them in this blog article. Before I move onto this step, I always like to give myself some space and just take a step back from my article. I then come back and read through it, finding all my spelling errors and weird things I did to a sentence that will dissuade someone from continuing to read. A big helper in editing my blog articles is Grammarly, which double checks my spelling and grammar without making me feel like a dunce! As I'm going through, I'm also optimizing my article for SEO (search engine optimization), so I make the most out of my writing! Check out Blog Article SEO 101 to find the minor steps you can take to help boost your article to the #1 search result for your topic. As I write this, I know the hypocrisy in my words considering this article is severely lacking in imagery, so let me start with an apology, I'm sorry that this article was not more visual. But let this be an example to you of what not to do. How much more engaging would this article have been if I had more images throughout it? How much easier would it have been to scroll through and have those images catch your eye? Images are super engaging! And my only excuse for not having more of them is my inner perfectionist who says "if they can't be exactly what I want, I won't do them at all." This is not a productive attitude, but hey, the first step is admitting you have a problem, right? Moral of this section: add some images in, whether they are cute (yet pertinent) pictures or pretty quotes of your article you made in Canva (you can see an example of how I've done that here) they are necessary! Step 9: Take that thing live! You have done all the steps to writing your first blog article - high five! Now, all you have to do is schedule it for a future date or just publish it right here and now. Keep in mind, this isn't really the end of this article. The work surrounding this article isn't quite done yet, meaning you need to share it! Not only put this baby on social media but send it out to your email list and let them know you are have started writing a blog and commit to being a blogger now! It's great for me to outline all the steps to writing a blog article, it's better for me to share an example! I am going to act like I am a local donut shop that just sells really good donuts 7 days a week (this may or may not be a dream of mine). What would writing a first blog article be like for this local donut shop? Step 1: My audience is going to be aged 16+ people who love to eat donuts. They love the everyday staples (chocolate frosted with sprinkles) and the creative (brioche donut with an apricot glaze stuffed with cream). They aren't super interested in the gourmet side of donuts, they aren't interested in a donut that cost $6, they want a tasty donut for an affordable price --something they can eat with their eyes and their mouth. Step 3: I am going to go forward with "what exactly is a fritter" and I'm going to go with "what is an apple fritter" as my keyphrase. I know you're saying to yourself, "But, Cami, your topic doesn't have 'apple' in it" and I know, I switched it up. I did this because when people think of fritter donuts, they typically think of apple fritters and a quick Google search tells me no one directly answers "what is an apple fritter" so it leaves the search results wide open for me to take over! What is an apple fritter? What makes up a fritter? Can there be other fritter flavors? My simple topic expanded to cover all the questions that may arise and give some insight into how we actually make fritters, giving a behind-the-scenes look at our process. 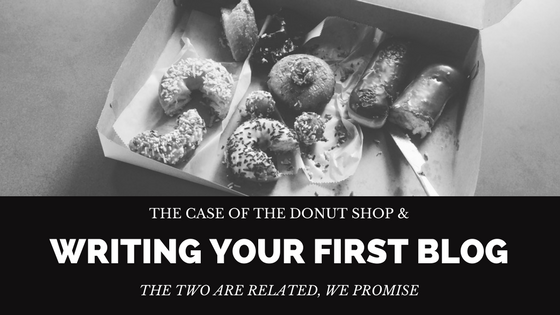 Step 5-9: Since this shop isn't real, I'm going to let you imagine I wrote and published this article for the best donut shop in the world. Now you're ready to go off and write your first blog article, all I ask is if you're a donut shop, you don't steal my blog article idea!